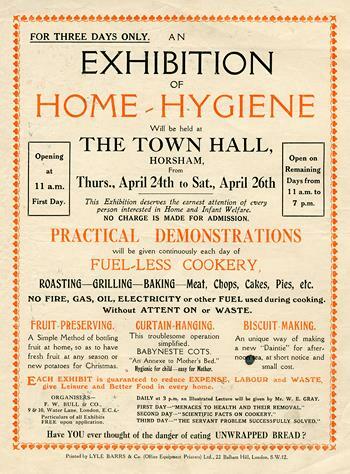 An Exhibition of Home Hygiene will be held at the Town Hall, Horsham, Thursday 24th April to 26th April. The Exhibition deserves the earnest attention of every person interested in Home and Infant Welfare. No charge is made for admission. Practical Demonstrations will be given continuously each day of fuel-less cookery, Roasting, Grilling, Baking, meat, chops, cakes pies etc. Fruit preserving, curtain hanging, biscuit making. Each exhibit is guaranteed to reduce expense, labour and waste give leisure and better food in every home. Organisers F W Bull and Co, 9 and 10 Water Lane, London EC4. Daily at 3 pm an illustrated lecture will be given by Mr W E Gray. Have you ever thought of the danger of eating unwrapped bread? Printed by Lyle Barrs & Co (Office Equipment Printers) Ltd., 22 Ballam Hill, London, SW12 .